This was the colour that really took my heart when I started. 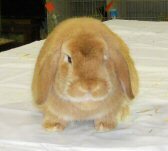 My first breeding pair of dwarf lops were orange and Tyson, the buck, is in the banner of my web pages. 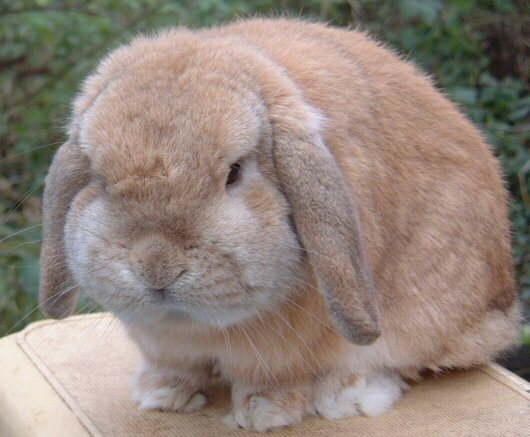 For about 18 months he was my only show rabbit, and my pride and joy. It took 2 generations of breeding to produce something to match him. Not only was he a great showman, he was a good stud buck and a wonderful friend. His legacy lives on in my lines today. Much of my current success I owe to Jane Duffy and her lines, and also those of Driftwood stud. During 2004 my main orange buck was Teddington. 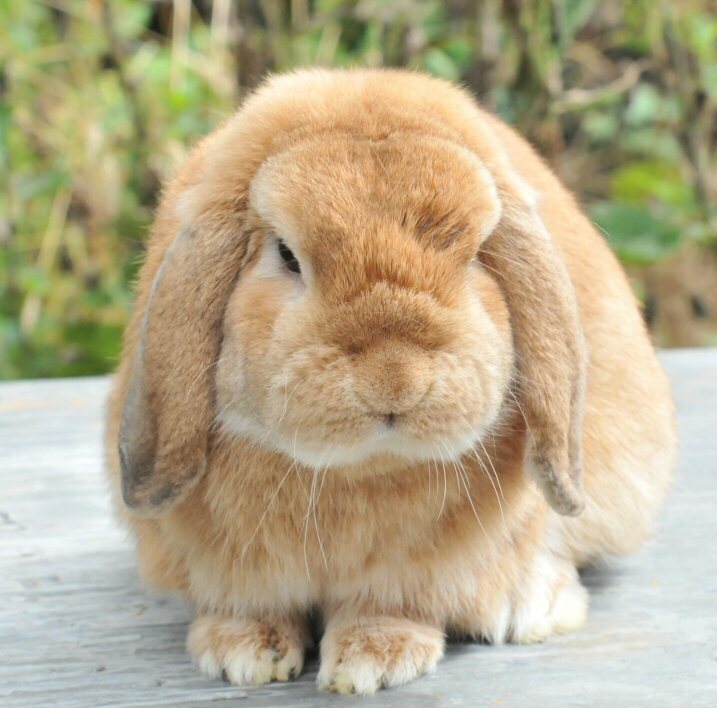 He has gained 3 Best of Breeds that year alone, and when I count them probably enough CC’s to become a double National French and Dwarf Lop club champion, and all before his second birthday! The first of my rabbits to achieve this level of success. 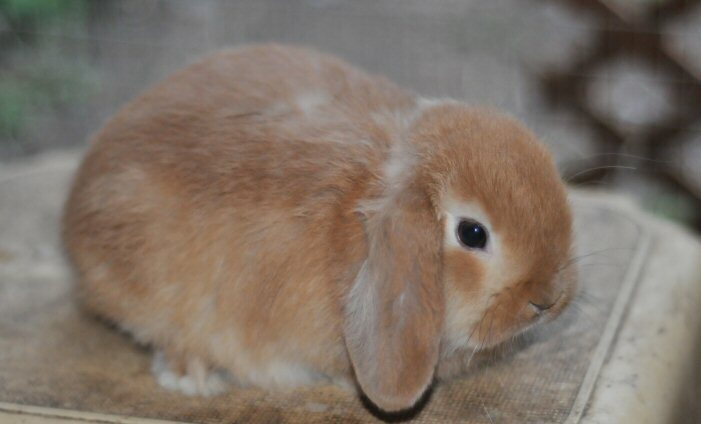 I am now onto my third generation of crossing the imported mini lops with the UK dwarf lops. The latest litter of 4 girls look lovely. Two will be staying here. The second generation buck is now looking for a new home, having sired a very handsome litter here. The first orange litter of 2012. Tennleyson is their Dad. Its planned for a buck and doe to stay here. 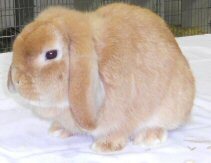 Tennleyson, father to many of the rabbits in the shed and doing well at the shows. Below the first litter of oranges born this year. 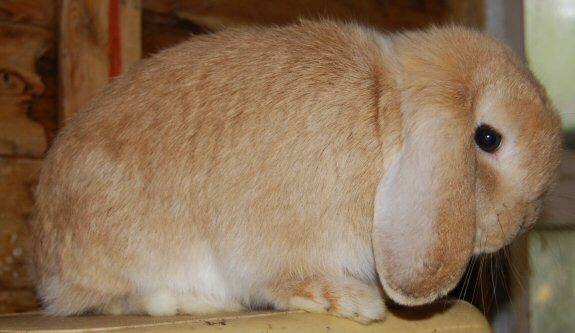 Mum is a mini lop doe bred in Germany and Dad Tennleyson. Using the imported oranges has given the lovely darker orange orange compared to the lighter colour. High rufus buck at Bradford 2011. He came 3rd out of 8. The orange boys on the judging table at Bradford 2011. In order to deepen the colour of my oranges I bought a trio of ‘reds’ from Holland. The two does were mated to Tennyson who was my most successful show buck in 2009. Here is one of the first litter of imported high rufus (bright orange does) to Tennyson. The orange is becoming less intense as they mature but is still darker and currently without less ticking than I have achieved here previously. 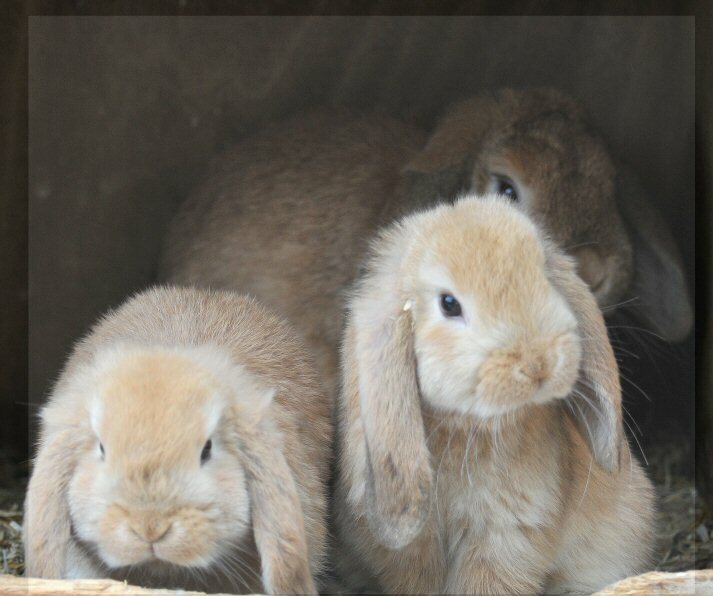 There is also a litter of pure dwarf lops running on. Currently I am very pleased with their ear carriage and some of the coats. A slightly coarse texture. The two photos show the difference in colour the high rufus imported and pure UK strain. A good start to the year with a litter of oranges from Tennyson, Trison’s son. Finally a litter that contained bucks not just does!! Two bucks have been kept here. Tennyson himself went to Bradford Championship show for the first time and beat his father Trison. 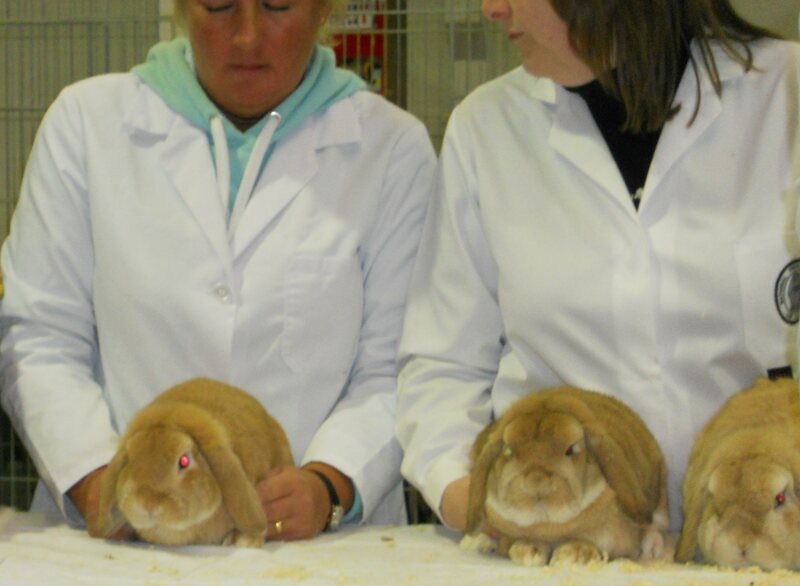 I was thrilled when Tennyson took all the orange cc’s at the Lincolnshire Championship show in December. At the end of the year I have a son from Trio, and a son and daughter from Skippy and Trio. Trio’s son has been doing well as shows, beating his Dad several times and the doe is expecting her first litter. 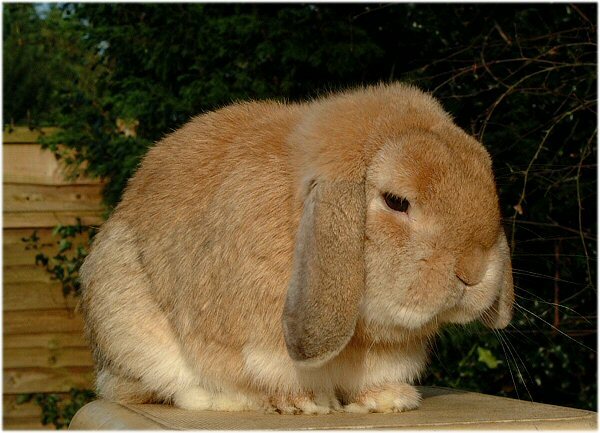 Unfortunately things do not always go the way we hoped or planned, and neither Tiger nor his son, Toddy, have made good show rabbits. However Tiger has proved himself to to be good stud buck, (one of his daughters is the orange doe in ‘the gallery’), and at least one daughter will stay here. 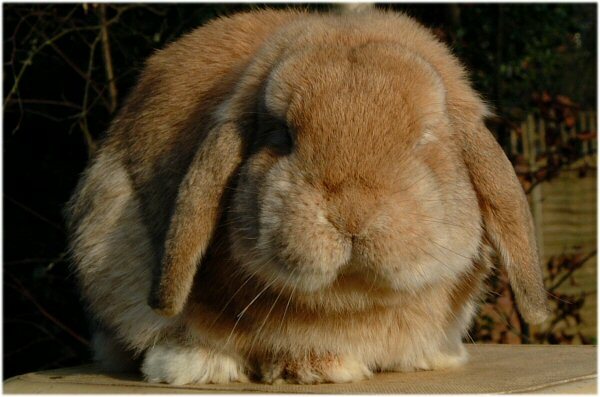 Toddy went to a lovely pet home. My next ‘big hope’ is a young orange buck, Trio, bred earlier this year by Teddington, to a doe called Trinny, who has much less ticking than Teddington. The resulting litter are good type and so far showing less blacking ticking than Dad, so fingers crossed. His first show will be at the end of May. Trio, orange buck March 2006. Bred by Trinny and Teddington. Trio, has matured nicely and has beaten his father, Teddington on several occasions. He sired his first litter in December and they are all doing well. Pictures of Trio taken December 2006. Maturing into quite a nice, stocky, yet compact boy. The oranges and fawns are my favourite colours. Particularly as youngsters, at about 6 weeks old, they look like little teddy bears. A clear coat covers their chunky little bodies, and a good adult at this age will resemble 2 pom-poms stuck together, ie a nice rounded head and body. As the babies develop quite often ‘ticking’ develops. This is the appearance of black hairs in the coat. These develop as really the orange is a dilute agouti (wild rabbit colour) and agouti is a mixture of colours including black. 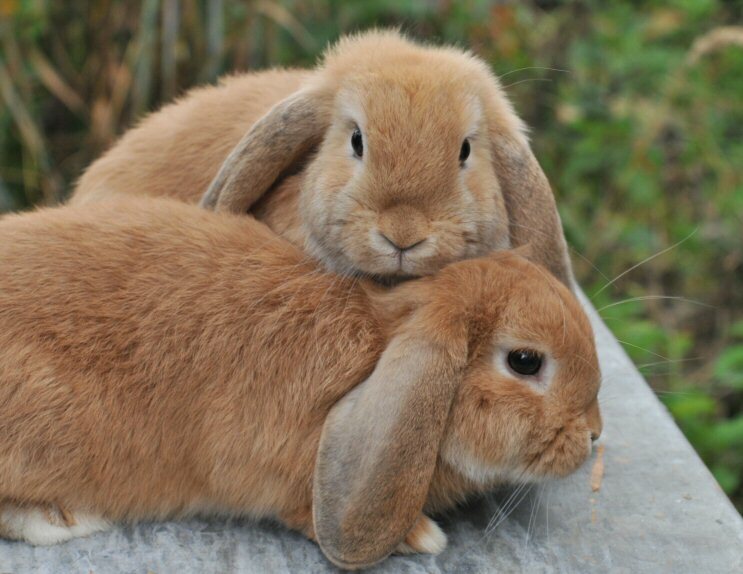 The ticking is visible in older rabbits, and in my lines in the winter coat more than summer. Some judges penalise for this, others knowing how difficult it is to breed out and yet retain the rich colour, allow for it. There are many ideas on methods to remove this ticking, by breeding oranges to fawns, as the fawn is a blue based, paler colour the ticking will be less noticeable, to breed a chocolate to orange, or use a frosty. 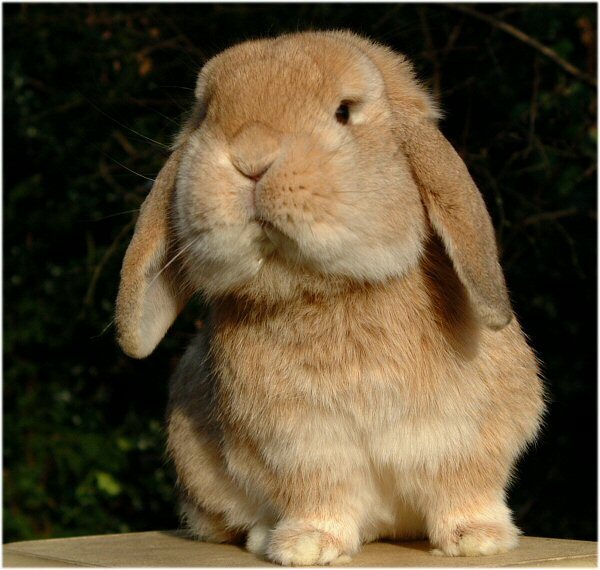 This is a white rabbit, with slightly darker nose and ears, with dark eyes, bred from oranges. I have bred orange to a good line of fawns and this has helped reduce the ticking, but as yet not tried the other techniques. 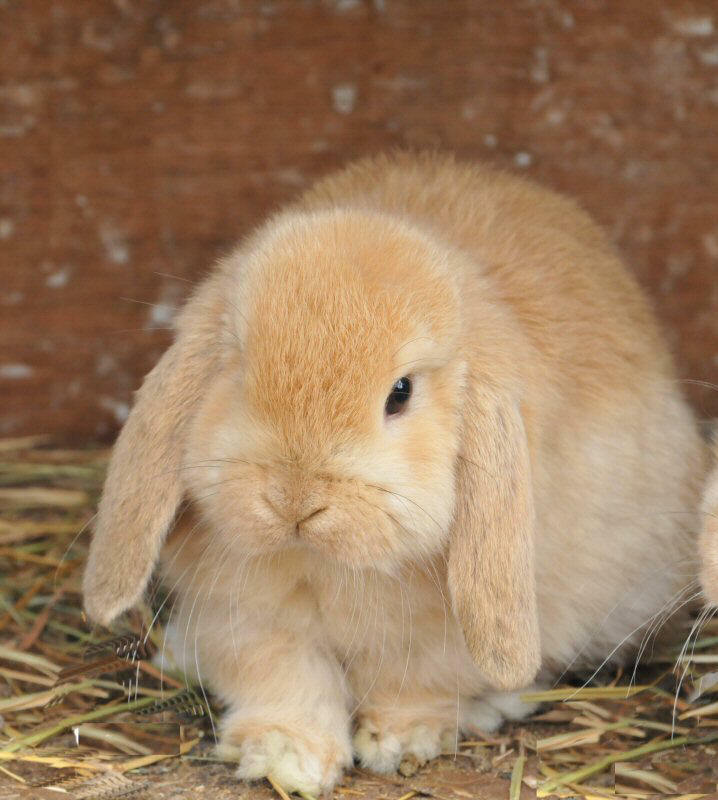 Usually I try to pick the one with less ticking from the litter, but this should be balanced with picking the best typed rabbit as well, as type carries more points than colour on the show table.